It’s hard to believe that today is the last day of the Falmouth Art Market—the gathering of artists and musicians that takes place every Tuesday afternoon at Town Hall Square throughout the summer. This afternoon’s event will include a wide range of artists and craftspeople, along with folk and Celtic music by John Yankee on hammer dulcimer from 2:30 to 5 PM and Four Guys in Tuxes (The Trio) Four Guys in Tuxes, playing jazz and swing standards from 5 to 7:30 PM. Throughout the summer, I have written press releases for the Art Market, and because the artists continue to create and sell their work, even as summer ends, I am including the artist profiles I wrote up for those releases here. Initiated by Marty Tulloch six years ago, the art market was coordinated this year by a small group of artisans led by jewelry artist Candy Proctor. 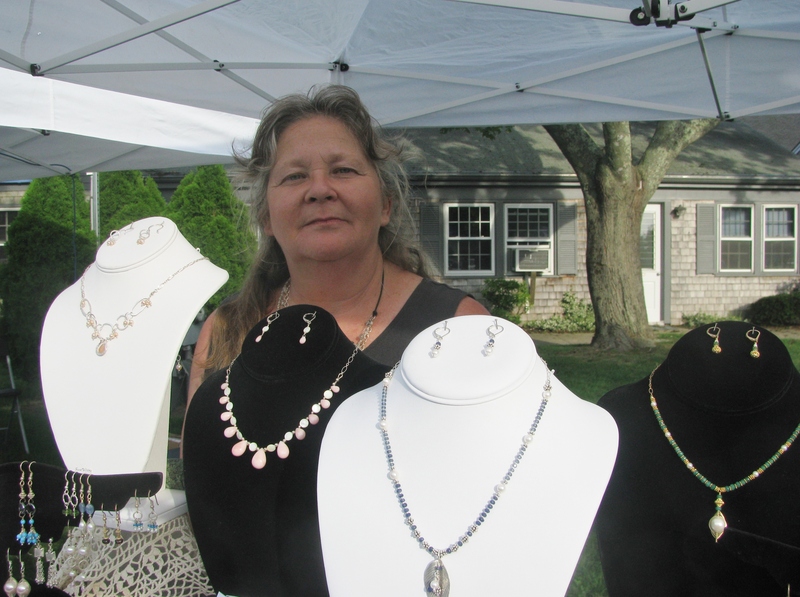 Candy Proctor, owner of PaxGaia Designs, makes jewelry of precious and semiprecious materials. With a background in science and medicine, Proctor has always enjoyed creative outlets and jewelry making came naturally to her. Her interest was sparked when she was reconstructing an old chandelier about eight years ago. Harmony and balance are revered elements in her life and are reflected in her jewelry designs. She enjoys the opportunity to work in color and light and is drawn to designs with natural precious and semi-precious materials. 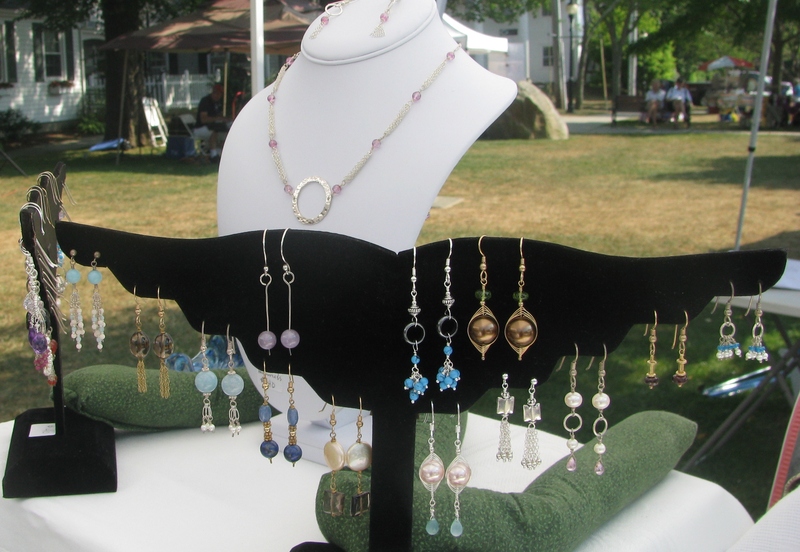 At the Falmouth Art Market, she offers earrings, necklace-and-earring sets, and anklets in a range of colorful stones with handmade components of silver and gold. Among the items on sale recently were a ruby necklace set, a sapphire necklace set with saltwater pearls, a necklace of Peruvian opals, and items with peach moonstone, topaz, and other gems. Proctor finds jewelry making and designing relaxing; she enjoys the rhythm of it and the pleasure of making something beautiful. For more information on PaxGaia Designs, visit www.etsy.com/shop/PaxGaiaDesigns. 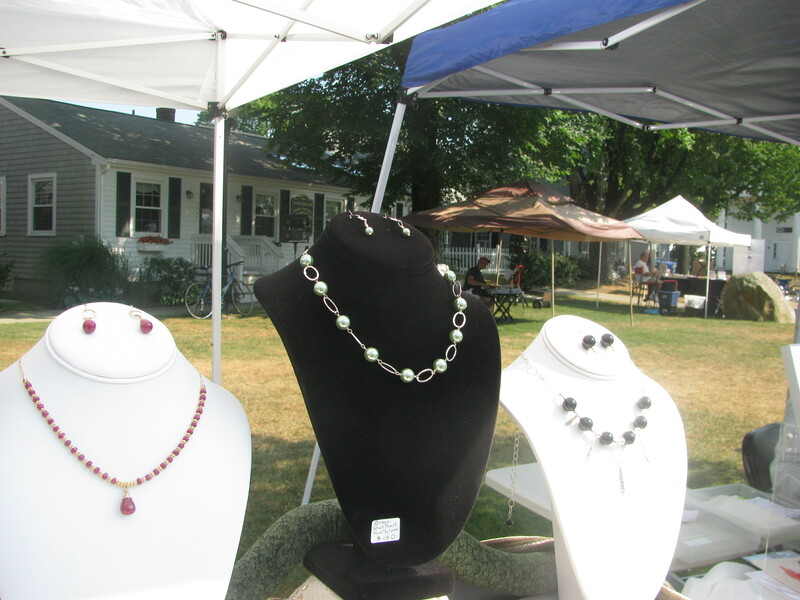 For more information about the Art Market, visit www.falmouthartmarket.com.